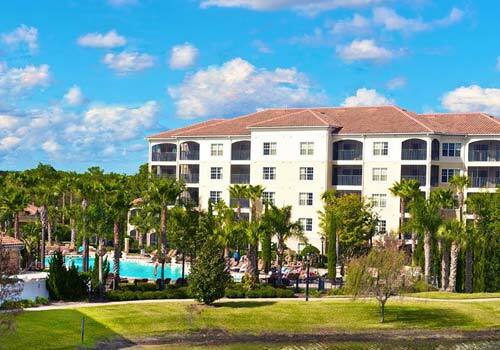 Located only two miles from Walt Disney World® Resort, WorldQuest Orlando Resort is a quiet and classy refuge within the theme park capital of the country. 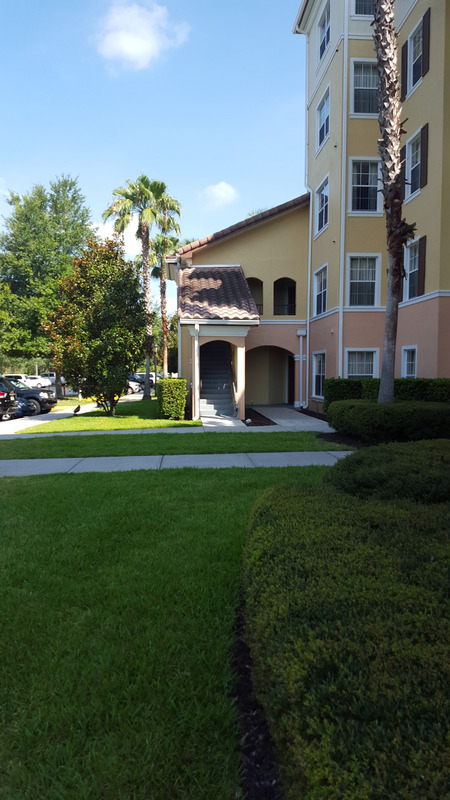 Discover all the best destinations in Orlando, FL from our luxury lodging, which combines superior customer service with sophisticated and abundant amenities. Situated in a gorgeous setting surrounded by palm trees, our spacious suites are inspired by the majestic European villas of the Mediterranean. 2 miles from Walt Disney World®. 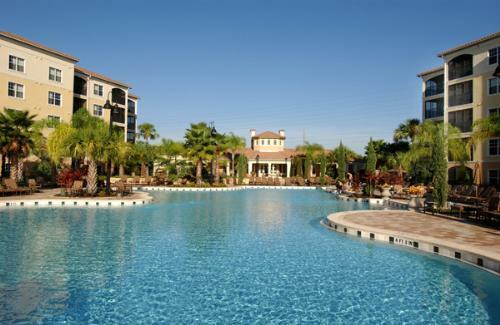 10.1 miles from Universal Orlando® Resort. Complimentary scheduled transportation to Walt Disney World® Resort. Complimentary wireless internet is available in all guest suites, the lobby, and the pool area. Resort fees apply and are due at check-in. 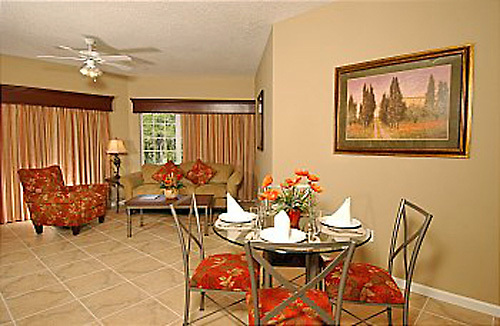 Vacation in luxurious comfort at WorldQuest Orlando Resort in beautiful Florida. 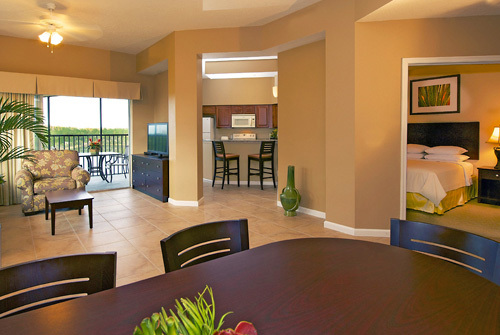 Each of our condominium-style 2 and 3 bedroom suites features a full kitchen and separate living and sleeping areas. 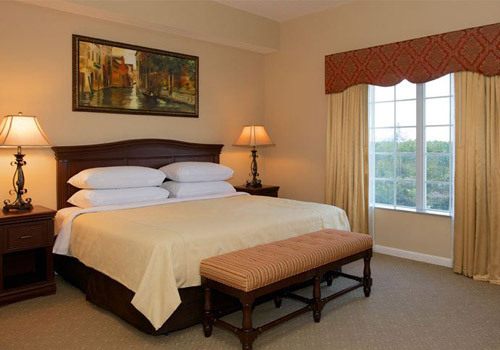 Custom furnishings, plush bedding, granite countertops and top-of-the-line appliances further enhance your home away from home at WorldQuest Orlando Resort. 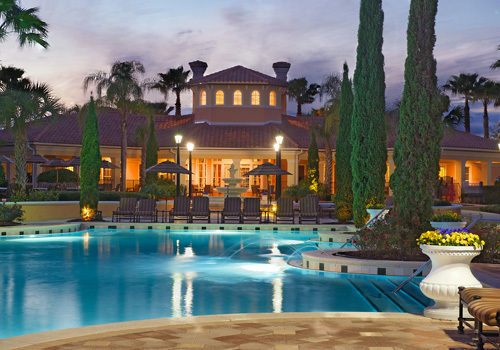 The Mediterranean-inspired WorldQuest Orlando Resort is the perfect all-suite hotel for your Florida vacation. 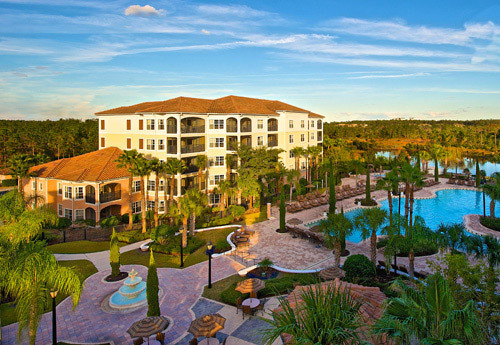 WorldQuest Orlando Resort is located just one mile from Walt Disney World and a short drive from SeaWorld, Universal Studios, and Epcot Center. 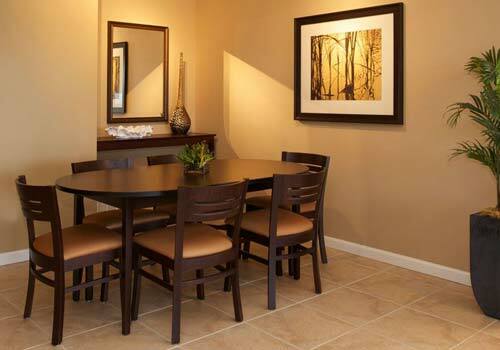 International Drive and scores of delicious restaurants and designer shopping are minutes away. Resort fees paid upon check-in. Housekeeping service is available upon request. Fee applies (from $6 - $39 per day, plus taxes) depending on services needed. The apartment was great. The swimming pool was fantastic. 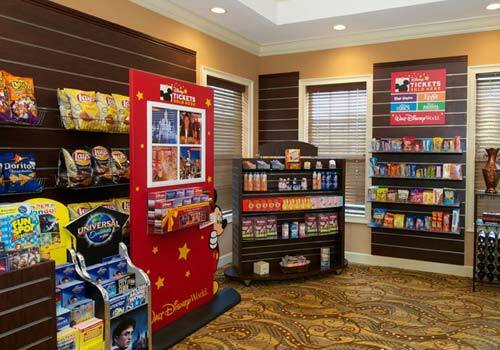 Tip: The place is nearby the parks but better to have a rental car. The room are very nice. And big. I only give 4 stars because the shuttle to the parks are terrible from the resort.only 2 runs in the morning and only to Epcot. We had to use uber car all the time.we came from NY and didn't rent a car because they said they have shuttle to the parks. If u want to stay here you need a car. Tip: If you have own car ,this is a great place to stay. We had a wonderful, 2-night stay at WorldQuest. We had 3 adults and an 18-month old and were very comfortable in the two-bedroom condo. It was very nice to have a full kitchen, living room, screened-in balcony, and laundry in the unit. We also found the pool to be quite refreshing. Absolutely beautiful accommodations. Clean rooms. Very friendly staff. 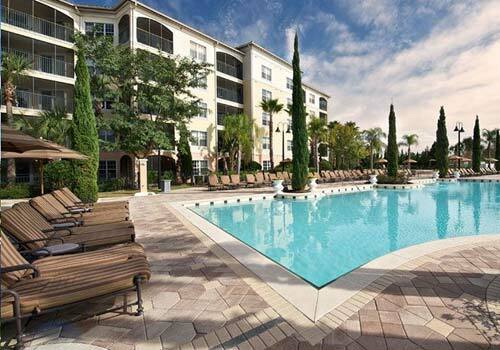 My new place to stay when going to Disney!! Tip: Clean and friendly staff. We came here to celebrate a quinceañera. Our experience was fabulous. 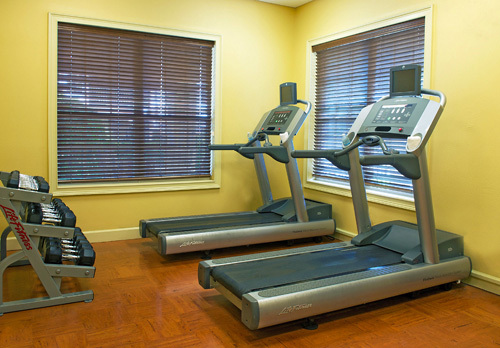 Friendly staff, clean rooms, balanced breakfasts. Definatly we are coming back! Tip: Cleaned rooms, balanced breakfast. Does WorldQuest offer shuttles to the theme parks? Yes. They offer shuttle service to and from the Disney theme parks. The shuttle leaves from WorldQuest at 8:55 am, 10:55 am, and 12:40 pm. The WorldQuest shuttle leaves the Disney Park (from Epcot) at 6:30 pm, 8:45 pm and 10:30 pm. 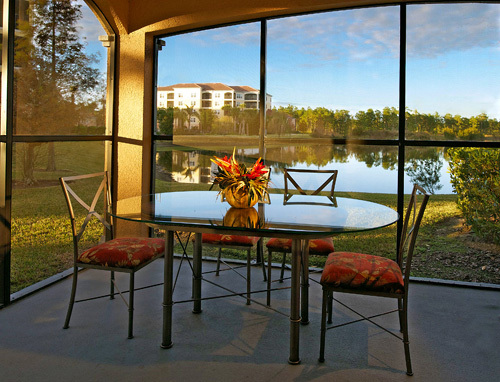 How many condominiums are available at WorldQuest Resort? There are 175 condos available at this property. How many floors is each condo unit? There are 5 floors total. WorldQuest is comprised of 7 buildings. Adjoining rooms are not available at WorldQuest Resort. How many bathrooms are in the two and three bedroom units? 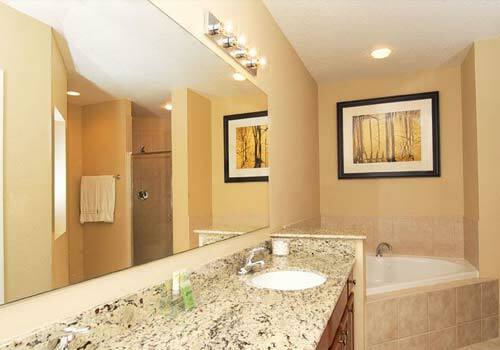 Both unit types have two bathrooms. Do you have a restaurant on-site? Lounge? Café? Yes. 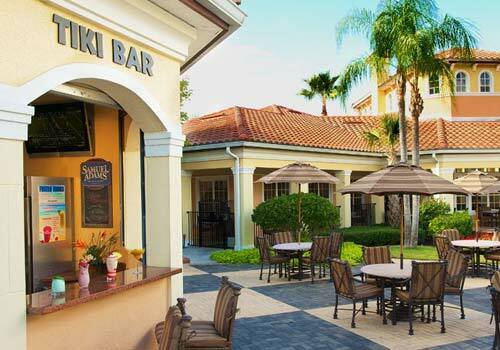 WorldQuest Resort offers a 24-hour, onsite market and Tiki Bar. The Tiki Bar is open from 12:00 pm to 9:00 pm. Does WorldQuest Resort charge any resort fees? Yes. There is a mandatory daily resort fee per condo of $23 plus tax ($25.88 total) that is collected upon check-in. There are housekeeping options available that are an additional fee. Note fees are subject to change. How much are the housekeeping fees, if I choose to have that option? WorldQuest Resort charges $39 per day for housekeeping services. However, this is an optional service for guests staying three nights or more. 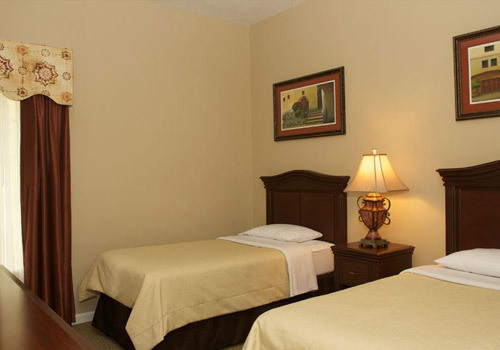 For guests staying three nights or less, there is a mandatory cleaning fee of $40 charged. Do you have a minimum age required for check-in? Guests must be at least 21 to check-in at WorldQuest Resort. Do you charge for cribs? Cribs are free of charge. What are your pool hours at WorldQuest Resort? The pool is open from 6:30 am - 11:00 pm. Is the outdoor pool at WorldQuest Resort heated? Yes. The temperature is 80 degrees. Yes. Guests can check-in at any time. Is smoking allowed on hotel property? The hotel provides designated outdoor smoking areas. All rooms are strictly non-smoking. No. For the safety of guests, pets are not permitted on hotel property. Certified service animals are allowed upon presentation of registration/certification.